Archie points out that most, if not all, animals have a gut microbiome — an incredibly diverse “rainforest” of bacteria that lives in the intestine and helps animals digest food, make vitamins and fight disease. The new study revealed that baboons that had closer social bonds had more similar gut bacteria than animals with weaker social ties. “In the last few years, scientists have seen some hints that social relationships can shape gut bacterial communities,” Archie said. “For instance, we know that people who live in the same house have more similar gut bacteria than people who live in different houses. However, such studies haven’t been able to get at the processes that drive these effects. 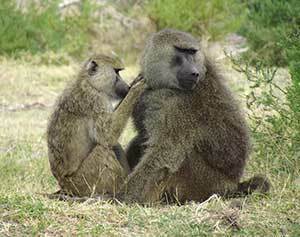 These social effects on gut bacteria may also influence the jobs gut bacteria do for baboons. The study was conducted at the Amboseli Baboon Research Project (ABRP), a long-term study of wild baboons in Kenya. ABRP is directed by Susan Alberts and Jenny Tung of Duke University, Jeanne Altmann of Princeton University, and Archie. Since 1971, this project has followed the lives of hundreds of wild baboons, giving the researchers very detailed data on the animals’ social relationships, diets, habitats and genetic relationships. To measure the baboons’ social relationships, researchers with the ABRP watched them for a year, recording data any time two baboons groomed each other. During grooming, the animals comb through each other’s fur, pulling off dirt, parasites, and dead skin, and sometimes they eat what they find. This behavior is probably important in bacterial transmission. Although the study was conducted in wild baboons, the results have potential relevance for the human gut microbiome. The results of the study raise the question: are socially transmitted microbes a good thing or a bad thing? The results of the study are described in a paper appearing in the journal eLife. The research was funded by a National Science Foundation CAREER Award to Archie and by the National Institute of Health’s National Institute on Aging. Archie was the leading investigator on the research and Tung was the first author of the paper. Alberts, Altmann, Blekhman, Barriero and Archie are co-authors of the paper.